Sen. Susan Collins of Maine, her longtime friend and fellow moderate Republican, spoke on the Senate floor for 45 minutes, explaining her support for Kavanaugh in detail. Though they reached opposite conclusions, both women had faced similar political pressure heading into Friday’s key vote on Kavanaugh’s high court nomination. As moderates who support abortion rights, their joint opposition could have been enough to sink Kavanaugh, whose nomination was thrust into uncertainty following sexual assault allegations. Ultimately, it was Collins who put Kavanaugh on the brink of a lifetime appointment. Minutes after she finished speaking, West Virginia Democratic Sen. Joe Manchin said he, too, would back Kavanaugh, ensuring at least 51 “yes” votes in the Senate. All three senators — along with Arizona Republican Jeff Flake — had been publicly undecided for weeks as they faced unrelenting pressure from both sides. Collins told a rapt Senate that she does not believe that sexual assault allegations against Kavanaugh rise to a level to “fairly prevent” him from serving on the high court. Kavanaugh deserves a presumption of innocence, Collins said, and allegations by Christine Blasey Ford and other women did not reach a threshold of certainty. Murkowski chose the opposite path. “I believe that Brett Kavanaugh is a good man. It just may be that in my view he’s not the right man for the court at this time,” Murkowski told reporters after voting to oppose Kavanaugh in a procedural vote Friday morning. Within minutes of their announcements, potential political challengers to both Collins and Murkowski emerged. Former Alaska Gov. Sarah Palin insinuated she could run against Murkowski in a Republican primary, tweeting, “”Hey @lisamurkowski — I can see 2022 from my house.” The tweet was a reference to an infamous “Saturday Night Live” skit in which Tina Fey, portraying Palin, said she could see Russia from her house. Susan Rice, the former national security adviser to President Barack Obama, volunteered herself on Twitter as a Democratic opponent to Collins in Maine. In a second tweet, she cautioned that she was “not making any announcements” but was “deeply disappointed” in Collins’ vote. In the Capitol, however, both senators won praise from their colleagues. “I think what Susan did today was rise to the occasion when the stakes were so high,” said Sen. Lindsey Graham, R-S.C., one of Kavanaugh’s most ardent supporters. Flake said he thinks “the world” of Murkowski and said she made her own decision despite intense pressure to vote yes. “I admire her a lot,” he said. Murkowski said later she opposes Kavanaugh but will ask to be recorded as “present” during Saturday’s confirmation vote to accommodate Republican Sen. Steve Daines, who will be at his daughter’s wedding in Montana. Senators often partner like that to allow an absence without affecting the outcome. Murkowski said her decision was “agonizing” and she was “truly leaning” toward confirming Kavanaugh. But after watching his testimony, she said, she could not in her conscience conclude “that he is the right person” for the court at this time. Murkowski’s vote was the latest example of the independent streak she forged since overcoming a Republican primary challenge in 2010 to win re-election as a rare write-in candidate. She was re-elected in 2016. Murkowski has expressed unease with the sexual assault allegations lodged against Kavanaugh, which he denies. She has faced pressure from home state Alaskans, including Native Alaskan women, who have described the scourge of sexual assault. Collins took pains to say she believes Ford suffered a sexual assault that “has upended her life,” but said she was not convinced Kavanaugh was the culprit. None of the people at the high school gathering where Ford said the assault took place have corroborated her account, Collins said. Even so, Collins said she hopes the ugly fight over Kavanaugh’s confirmation will raise awareness of the pervasiveness of sexual assault. 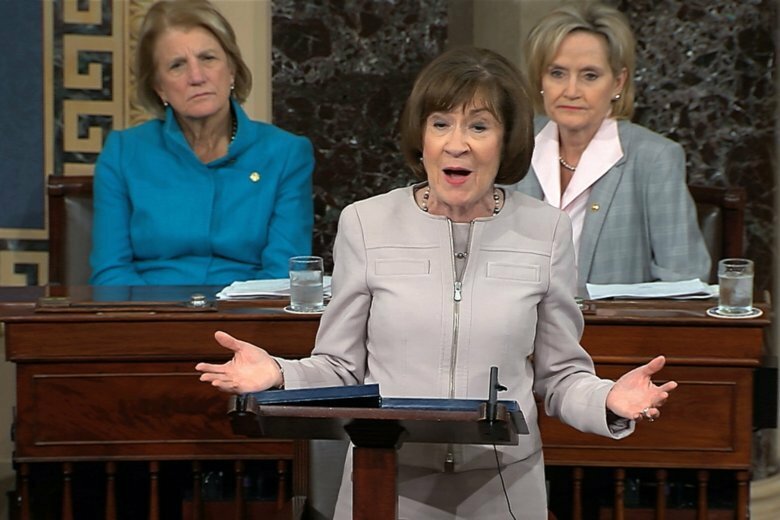 She supports the #MeToo movement, Collins said, calling it badly needed and long overdue. Collins has never opposed a Supreme Court nominee, voting to confirm the past five justices from Republican and Democratic presidents. Besides interviewing and talking to people who know Kavanaugh, Collins said she assembled a team of 19 attorneys to assist her in examining his judicial record. She called the appeals court judge eminently qualified, adding that his judicial philosophy is well within the mainstream. In keeping with her deliberative style, Collins had kept mum for weeks about how she would vote. Still, she sent signals that Kavanaugh had cleared a hurdle by reassuring her that he believed the 1973 Roe v. Wade decision on abortion rights is settled law. Democrats argue that Trump picked Kavanaugh, in part, because he is likely to vote to overturn that ruling. Collins and Murkowski are the only GOP senators who support abortion rights, a crucial issue in the Kavanaugh debate. If confirmed, Kavanaugh could tip the court’s balance toward conservatives for a generation. Murkowski also rendered her decision Friday in dramatic fashion. As the clerk read names in alphabetical order on a procedural vote to move the nomination forward, all eyes were on Murkowski. When it was her turn, Murkowski stood up, paused, and whispered “no,” her voice barely audible. Then she took her seat, looking down with a stone-faced expression. Collins, who sits next to Murkowski, leaned over and put her hand on the arm of Murkowski’s chair. The two huddled in deep conversation. Associated Press writers Mary Clare Jalonick and Juliet Linderman contributed to this story.